Honda has announced the cars have started arriving at select Honda dealerships today. The Clarity Fuel Cell will be available from 12 Honda dealers in California, namely six around the Los Angeles/Orange County areas, five in the SF Bay Area and one in Sacramento. The fuel cell version of the Clarity cannot be bought outright, as it's only available as a lease; Honda's suggested retail price for the vehicle is $58,490. 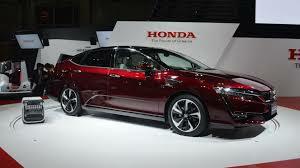 Already a year ago, Honda mentioned the 36-month lease price as $369 per month. For that, a Clarity Fuel Cell driver gets to do 20,000 miles annually, use up to $15,000 worth of hydrogen fuel, and gets to use a "luxury vehicle" from Avis for up to 21 days when in California – presumably for drives outside California's fuel cell station coverage areas. The 174-horsepower Clarity Fuel Cell's range is mentioned at 366 miles, its fuel economy has been rated at 68 MPGe combined, and it reportedly takes 3-5 minutes to refuel. It also qualifies for a $5,000 tax rebate. Compared to the similarly hydrogen-powered Toyota Mirai, the Honda's yearly mileage allowance is markedly higher, as a Mirai driver has to settle for a 12,000-mile limit. The Mirai's range is mentioned to be 312 miles, too, so the Clarity will take you farther in a couple of ways.